The total number of cases for 2019 is just 58 shy of last year’s 372, the second-highest number of cases in the last 20 years. Of those states, six – Arizona, Colorado, Michigan, Oregon, Texas and Washington – allow exemptions for philosophical and/or personal beliefs. 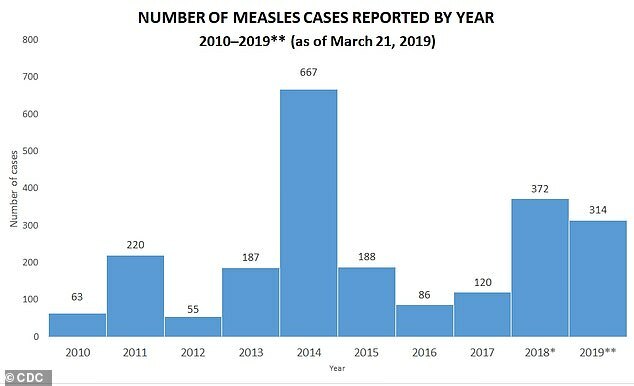 Meanwhile, in New York, there have been at least 332 confirmed cases in Brooklyn, Queens and Rockland County since October 2018 – all in Orthodox Jewish communities. In fact, this month, health officials in New York City said a single yeshiva – an Orthodox Jewish school – is linked to 21 new cases. The city’s health department says Yeshiva Kehilath Yakov, and two other schools, disobeyed standing orders to keep out unvaccinated children.